Next year will be a very big year for the labour movement, and no doubt for Labour, its manifestation on earth in the political system. In August 2019 it will be the 200th anniversary of the Peterloo Massacre and a golden opportunity for Mr Corbyn and his team to make a great deal of noise about the oppression of the working classes, the evils of capitalism, the misuse of power by Tory governments, and many other rather heavily drawn parallels. It should indeed be Mr C’s golden hour, and no doubt there will be a great deal of speech making and marching, and foolish comparisons with the lot of the workers of today (that is to say, nearly all of us), and those of two hundred years ago. If there are tides in politics, as in the ocean, then they are likely to flow Momentum’s way next summer. Indeed Mr Corbyn and his merry persons have already had a good spring tide in their favour, helped, we have argued in this column, by Mrs May opening the Tory sluice gates to increase the flow. The voter at the moment must feel that their choice is between Socialism, semi-Socialism by Cable, and Me-Too Socialism by May. Momentum and the current Labour leadership have done what every politician desires, which is to capture the agenda and run off with it, as the opposition trails behind. What is odd is that it is the left which is making the running; in the USA and Italy and Hungary and France and Brazil it is the right which is winning the war of ideas, though admittedly generally an interventionist right rather than a libertarian one. But the truth is that the voters are cross, so they vote against whatever is the prevailing orthodoxy. President Macron, his personal ratings down almost as low as Mr Hollande’s – and that is low – benefitted electorally from the “plague on all their houses” (as Ms Le Pen did). Now he is the establishment and the voters are rapidly becoming agin him. Mr Trump manages to retain the anti-establishment vote by labelling the Democrats as the establishment. And Mrs May? In conventional politics her ratings would be competing at the bottom of the graph with M. Macron’s. But she does have the advantage of Mr Corbyn. Theresa may think Corbyn-lite is the way to go, but Conservative voters, we suspect, will put their mark in any box which they think will keep JC out. Which is not to say that Tory loyalists are not angry. You don’t have to talk long to Conservative activists to realise how angry they are. Brexit is maybe the furiously burning logs in the bonfire, but Mrs M and her Chancellor do keep throwing more highly combustible materials on. The budget last week constituted a large can of petrol, but everything this administration does seems calculated to annoy those who should be its core supporters. Tighten up on gambling? Deferred (maybe because of intense lobbying, maybe because the Treasury needs the income from the tax on the terminals). More money for the police? Nope, law n’order can wait. Foreign aid up. Tax rates down. Well indeed, but NI up – not even mentioned in Spreadsheet’s speech. This does not feel like a Tory government – even the Blair/Brown continuum would have been embarrassed by these policies. Which brings us to the point of the gentleman whose image sits at the top of this article. Symbolically, the blessed Oliver is backed by scaffolding at the moment. Not supporting him, that doughty stern Huntingdonshire squire needs nothing to hold him up. The steelwork is holding up the mother of Parliaments, which, in a tidy metaphor, is crumbling fast. Could our democratic system crumble with it? The last time we had a proper uprising, a revolution, was in 1642. Peterloo almost became one, but was sternly and violently supressed by a Tory government. That government took a chance. This was only 27 years after the troubles in France which turned out so… Well, you will have your own views on whether they turned out badly or well, but they fundamentally changed French politics and society, and, slowly, those of many other European countries. Addington, the Home Secretary, was not risking revolution, and with Lord Liverpool’s somewhat nervous agreement cracked down hard. Too hard for many politicians, cracking a number of heads in the process, but he got away with it. Just, it will be said next August. And the Whigs began a process of constitutional reform that turned Britain into one of the most democratic countries in the world and the Whigs into the Liberal Party. Are our political systems more responsive than then? Are our citizens in a mood to rip up paving stones and fling them about? Is there a stern serious visionary political leader waiting for the moment to step forward and begin to channel the people’s anger? 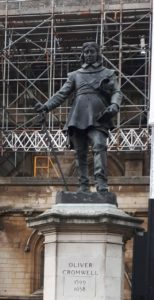 (It is wonderful to equate Oliver Cromwell and Nigel Farage, but so ridiculous we will not even try.) There was a time when Nigel seemed to become the Peoples Nige; but it has passed, even for Mr F it seems. Two weeks ago there was a march in London to call for a second Referendum; it attracted a lot of people who do not normally go on marches – somewhere between 150,000 and 200,000 seems to be the best estimate. As an astute political commentator said, having interviewed several participants, the Waitrose’s of North London must have been empty that day. These were not stone flingers or slogan chanters; no sign of trouble there. But supposing Mrs May imposes her Chequers settlement on a reluctant cabinet, an angry party, and some furious Leavers in the Midlands and North? Are we so sunk in social media and TV channel hopping that we would shrug our collective national shoulders, grumble a lot, and vote anything but Tory at the next chance? Or could we become a little Greek, a bit Italian, some Catalonian, with a touch of French fishermen and farmers? Could we revert to the behaviour of our C19th forebears, howling up and down the streets of Mayfair and breaking politician’s windows? Thirty years ago there was a lot of anger against Mrs Thatcher and her cabinet, especially over the poll tax, which did lead to a certain amount of stone throwing. But Mrs T had much support in the country, adduced through her large parliamentary majorities, and the quasi-rioters let off steam and went home, knowing that all they were doing was helping the lady pile up a larger majority next time. But now? We have an opposition that thinks revolution is not a bad thing, backed by a mass movement of the same heart. We have at least the possibility of a constitutional crisis if the Leavers do not get a reasonable slice of what they voted for. We have a large number of alienated voters who voted UKIP and don’t like any of the others above. A government, sullen and confused and divided. A populace genuinely and deeply divided on a matter of fundamental governance. And a police force which is stretched to the limit and whose morale is in its boots. No, it couldn’t happen here. It’s not in the nature of the British. Not now. Not in this day and age. But Oliver keeps his sword out of its scabbard outside Westminster Hall, and watches, and waits.